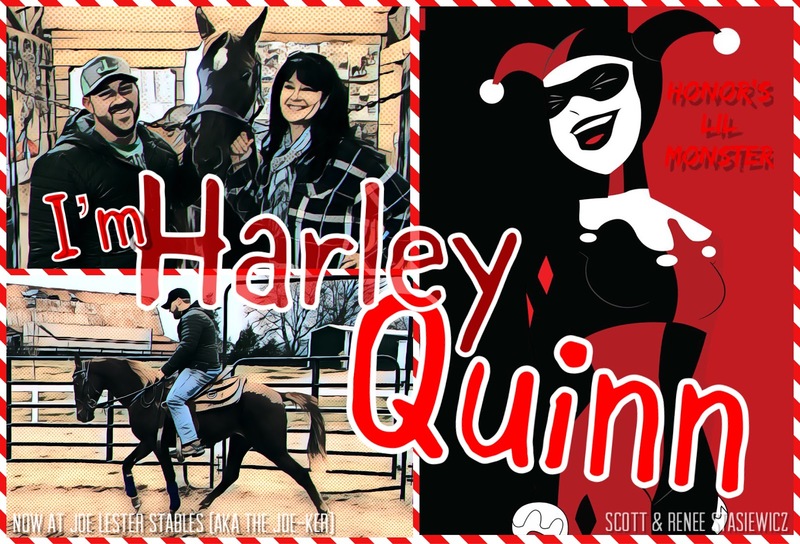 The Adventures of Harley Quinn Begin. 2018 begins an exciting new adventure. 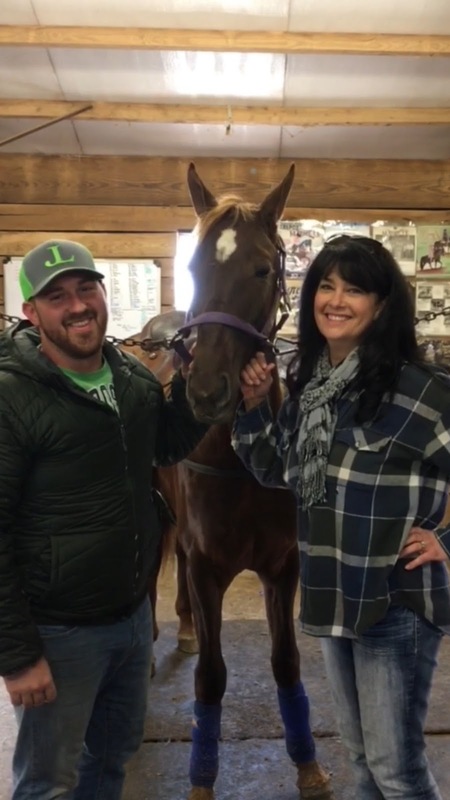 My Christmas present from Scott was to select a new show horse. I’ve been searching off and on for almost a year. But, I think I wasn’t ready. My hope was cemented with Halo - my perfect dream horse. And while we’ve overcome many set backs with injuries I feared undoing the progress made by putting him back into the pressures of a high performance scenario. 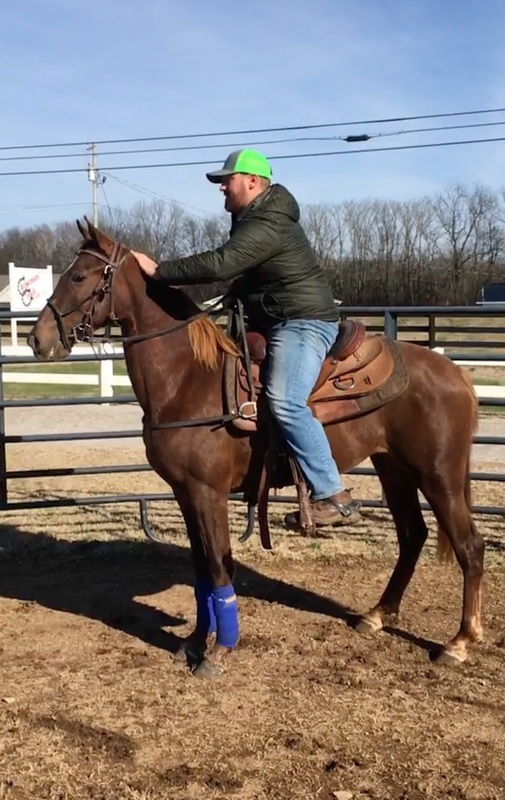 So, I refreshed my search for a new Tennessee circuit horse. I put my mind to it and got busy doing many things to accomplish my goal. I followed up on videos of horses posted on Facebook that caught my eye. I made many calls and PMs to let people know I was seriously shopping and to let them know my preferences. I kept updated on the progress of a coming 2 year old and kept tabs on a promising 3 year old that might be for sale. I made a trip here and there to see and ride a few prospects. It all can be fun and exciting, like a treasure hunt, but also daunting and stressful. I had to be focused on what I wanted. Specifically. One’s too old. One’s not moving like the dream horse in my mind. Another sells before I can jump on it. Prices vary so much and some are crazy high. What to do? What to do? Waiting. A lot of waiting. Hoping it’ll happen. But, I think you just know - in the moment. It was a Friday night. We were at home watching a movie. And my phone buzzed. I ignored it. But it buzzes it’s persistent second warning and I figure a peek wouldn’t disrupt my movie focus. I reach for my phone and turn it over to look. It was a text and I could see a video was attached. I opened the text and played the clip. Seven seconds. I clicked replay. Hmmmm! I hand the phone to Scott and say, “you may like to see this one.” He takes the phone, plays the entire seven seconds, hands my phone back to me and says, “buy.” Simple. Just like that. We both knew. I text back - “call me, let’s make a deal.” The phone rang two seconds later and literally I owned the horse five minutes after that. Well, pending vet checks and paperwork. Before the movie concluded I had booked a flight and texted Jane to see if I could stay with her .....plans were set to see this new filly in person. Hours later - my bags packed, I head for the airport. I’m so happy that Southwest has a direct flight now (right Cathy? ), one hour and fifteen minutes after wheels-up in Milwaukee, we land in Nashville. Love it! In fact, I can fly down in the morning and fly back late that night if I want. But I have three days here this trip. Time to see her, get a vet check and make the final call. Quinn on the cross ties. I meet up with Carlan for breakfast on the square. At this point, neither Jane nor Carlan know I have a very specific horse to see on this trip. In fact, I have a few additional appointments set up to see some really good potential babies. Scott thinks I should get two anyways. I’m like, huh? Okay! Lol. So I’m keeping options open, and my excitement in check. Seven seconds of video could be misleading. I’m hoping not but.....so for now, I hold tight to my secret hope. After breakfast and a little shopping at Bedford Tack, we turn up the long gravel drive to my purposeful destination. As I drive along the stable, heart beating and pulse going crazy, I can see someone pull a horse off a trailer and walk into the barn. I wonder if that’s her, as she was being delivered here today. I park and turn to Carlan and say - “well hurry up, let’s go see my new Filly!” She looks at me a little confused and then I see the realization come across her face as she smiles her excitement back at me. And we laugh and jump out of the car - now both of us with renewed purpose. As we enter the barn, Joe greets me with a grin and points to her in the cross-ties. “That’s her. She just arrived.” My eyes turn to her and I take in her unexpected beauty. I literally catch my breath and squeal,”oh my, she’s so gorgeous!” I actually had no idea what she’d look like. I had seen seven seconds of video. Maybe ten strides. I couldn’t tell if she had markings or her real color. So this was an unexpected and very pleasant surprise. She was perfect. Absolutely perfect! Well, except for that crazy pawing and wide eyed look on her face. Lol. Poor thing. Welcome girl to a new adventure. Joe takes HQ for a first ride. Joe was already busy saddling her up and we ventured out to his round pen. Probably ten minutes after we both arrived he was in the saddle and showing us her unbelievable potential. Carlan said wow, she’s nice. I agreed. Yes. Yes. Yes. Green as ever and only about 20 months old, but everything she didn’t even know she was doing was wonderful. Well, except for the head tossing and wide eyed look on her face. Lol. Motion like crazy. Stride for miles. Reach in front. Upright in the chest. Everything in those seven seconds of video, was all here in front of me again. Yes. She’s perfect. A call to Dr Baum and a vet-check appointment was made. He even mentioned how pretty she was when he arrived. It does catch you by surprise. She’s a striking red head. She has “It” factor. She must get it from her daddy. Her daddy is none other than WGC Honors! And her mama is Ms Keeneland, another great show horse. In fact, her lineage is an amazing mashup of great show champions. This is why I keep pinching myself that this little filly happened to fall into my lap one Friday night. Thanks Joe. You outdid yourself for me. She’s beyond my dreams. Thank you. I was lucky to get the vet on short notice as we were dealing with the New Years holiday. He rearranged a few things so he could do X-rays and give her a full review while I was in town. He also had Joe ride her. While there were a few things Dr Baum noted in his exam, the basics all looked good. X-rays good. Check. Check. Check. The final details were to send in her DNA kit and the papers. Oh yeah, and write the check. A month later she was “officially” mine. So, welcome 2018 and to a mad new adventure. 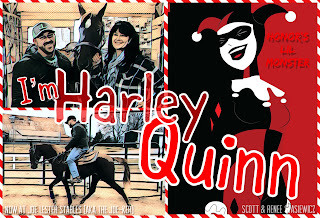 I’m super excited to present, I’m Harley Quinn.